Recorded by Justin Weis and Freight Train. When I listen to Freight Train‘s Burnin’ Down The Station CD I feel like I’m in some sleazy hole-in-the-ground bar hearing this great blues/hard rock band. 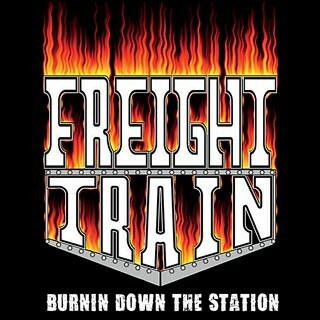 You certainly won’t feel that you are in some huge stadium when listening to Freight Train‘s debut effort. The production on the CD gives it a real live bar feel, especially with the way the drums sound and singer Dirty Al Duncan‘s ‘unpolished’ voice. Somehow, I think that this is exactly what Freight Train was trying to capture with their music — and you have to give the band props for achieving that. Not surprisingly, Freight Train‘s songs on this debut album all sound quite similar, even after a few listens — like a modern version of heavy metal innovators Blue Cheer. My favorites are “Holiday” and “Change In You”, the latter which has to be the ultimate bar type bluesy rock tune. “No Mans Friend” appears to be the only song that strays away from the Freight Train formula with what sounds like a bass intro and a more stripped back sound backing Dirty Al‘s vocals — but it’s not one of my favorites. “Voodoo” has some strange guitar work, perhaps in an attempt to provide a voodoo feel… and other weaker songs on the album include “Nobody” and “Can’t Get Enough”, where the vocals simply do not work that well and feel a little out of Dirty Al‘s vocal range. This is the type of music that any hard rock fan would likely enjoy in a live setting, but may not ‘love’ enough to hear over and over again at home or wherever else they are listening to Freight Train‘s music. The songs are certainly not the most original sounding but they are what they are — straight up ‘rough’ hard rock/blues songs played at a fairly fast pace.